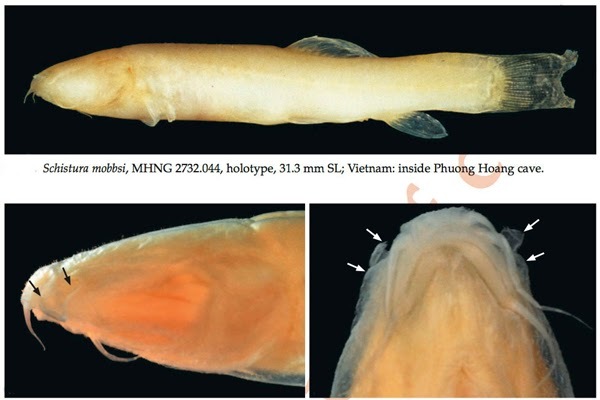 Type locality: Vietnam, Thai Nguyen Prov., Phuong Hoang Cave, Bac Song (Lang Song Prov. ), probably draining to Cau River, draining to Hai Phong, 21°46'31"N, 106°07'10"E.
Etymology: Named for the discoverer of the Phuong Hoang cave system, Jerry Mobbs. Schistura mobbsi has no eyes, no pigmentation and a limited ability to sense motion. Kottelat, M. & Leisher, C.. 2012. 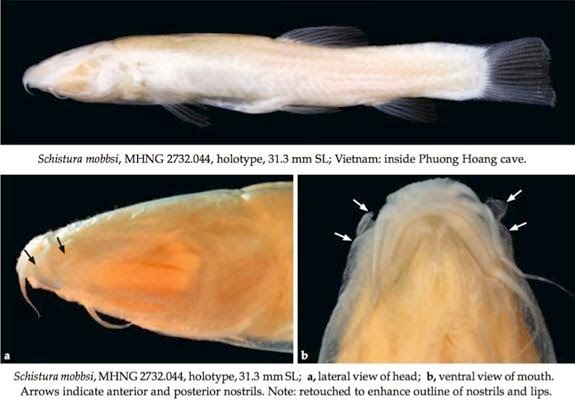 Fishes from Phuong Hoang cave, northern Vietnam, with description of a new species of loach (Teleostei: Nemacheilidae). Ichthyological Exploration of Freshwaters. 23 (3): 237-244.